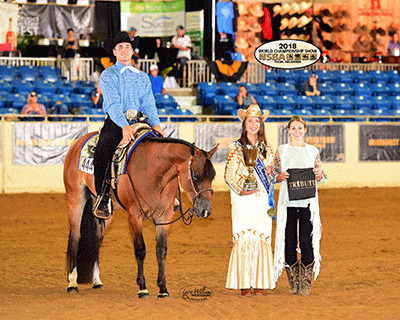 Friday at the NSBA World Championship Show and Breeders Championship Futurity saw a damp start but a sunny, sticky finish as the show continued. The Way To Go caught up with several of the day’s champions..
Hillary Roberts brought a familiar past show partner to the arena – Only Ever After - to win the Maturity Limited Open Western Pleasure. “She’s the start of it all,” Hillary said of her highly decorated mare. “She’s awesome. She is the easiest hors to maintain. She doesn’t like storms though, so I didn’t know what my situation would be with her since it was thundering when we started to show this morning, but it was all good. In the Breeders Championship Futurity Two Year Old Non-Pro Western Pleasure, Clay Arrington showed Ill B Batting Ona RV to the futurity win. “We call her Shirley,” Clay said of the mare, who is by Batt Mann and out of Ronnie and Vickie Kent’s Ill Be Dun Wonit. Nick Weiss came out of retirement to show Truth And Alibi, and became the futurity champion in the Breeders Championship Futurity Two Year Old Intermediate Open Western Pleasure. “This is my first time to show him,” Nick said. Another first time voyage resulted in a world championship for Tanna Petersak and Vodkamademedoit. 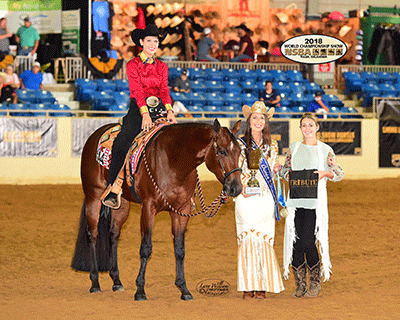 “This was my first time showing here at the NSBA World Show, and my first time showing her,” Tanna said of her mare, who is by RL Best Of Sudden and out of Hocus Pocus Princess. Julie Schmidt won her very first NSBA world championship in the Breeders Championship Futurity Color Two Year Old Limited Open Western Pleasure with Best Made Machine. The double registered APHA/AQHA gelding is by Machine Made and was started by Wade Parks. In the Three Year Old Limited Non-Pro Western Pleasure, Sarah Nimigan guided Best Brew At The Bar to another world championship title. 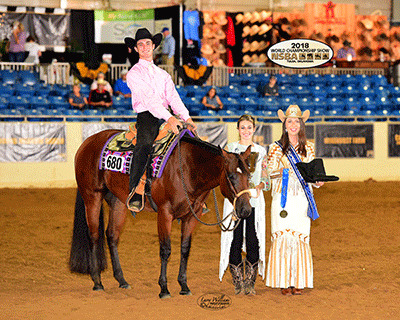 The duo had won the BCF Limited Non-Pro Western Pleasure on Thursday. In the Breeders Championship Futurity Color 3-6 Year Old Non-Pro Western Pleasure, Shez Flat Mystical and Bailey Anderson were named the futurity champions. The mare known as “Vee” is by VS Flatline and out of Mystical Machine, and is a breeding stock paint. Lori Augsburger didn’t look any further than her own back yard to find the Breeders Championship Futurity Two Year Old Limited Open Hunter Under Saddle champion. Her family bred and raised Kat Tails Are Blazing, who is by Hot N Blazing. “I couldn’t ask for more,” Lori said of her go. “She has a great top line and is slow legged, with a great cadence. I showed her one time at the Big A before coming here to the NSBA World Show. She’s so easy to be around, and very quiet. I think that she will probably be staying around.” Lori’s daughter Cheyenne or “Scoot” already has plans to make the mare her next Youth horse. 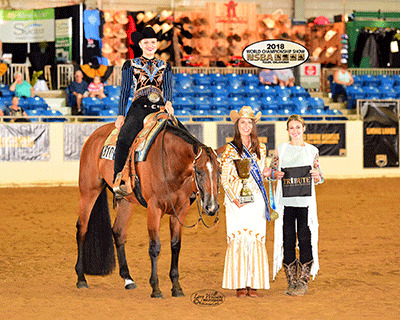 Only Blue Couture and Debbie Hodde also added another world championship to their count by winning the world champion title in Amateur Hunter Under Saddle. 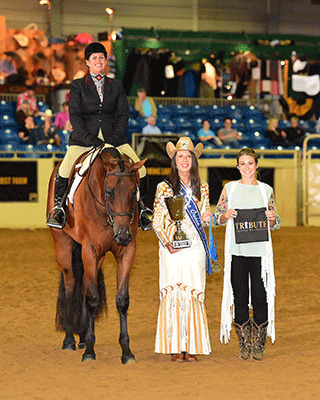 Non-Pro riders with Highpoint Performance Horses took the top two spots, with Shelby Ratliff and Willy Has Potential taking the reserve award. In an unusual Senior Western Riding pattern, 40 exhibitors found themselves maneuvering around the awards stage in the Built Ford Truck Arena as they changed leads and loped around cones and over poles. Jason Martin and Hesa Radical Zip, showing for Bonnie Sheren, earned the top score and the world championship title. “This is a special pattern that you only see at the NSBA World Show,” Jason said. “There are some horses that are really good at it, and some you’d rather not show here. Troy gets a little lost and looks around in here, but we’ve been having such a good year that I decided to show him here. In the Green Western Riding, Charlie Cole took the world championship with HP Prime Time, showing for Kaleena Weakley. “We’ve had a great horse show,” Kaleena said of the win. 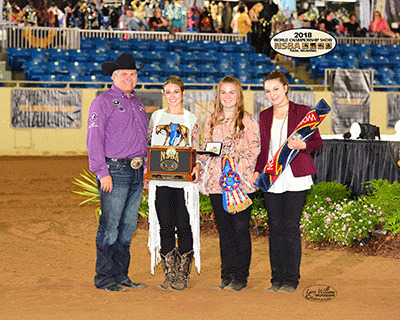 Friday ended with the NSBA Markel Insurance Breeders Championship Futurity Yearling Sale. Sold yearlings in the sale will become eligible to compete for their share of a purse established specifically for sale graduates in a designated BCF class during the horse’s two year old or three year old year. 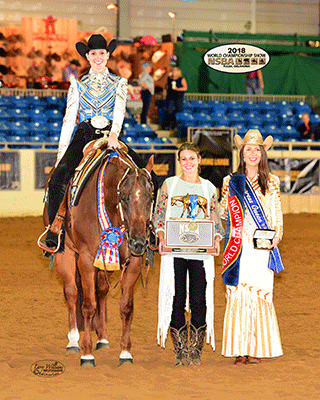 The NSBA World Championship Show and Breeders Championship Futurity continues through Sunday, August 19. 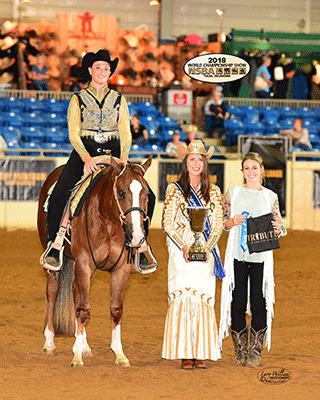 Be sure to check the NSBA Facebook page for updates regarding night riding schedules and announcements recognizing 2018 world champions throughout the week. Complete show results will also be posted at www.nsba.com.